Home best digital agency of the year 2019 digital sukoon dr.babasaheb ambedkar nobel award johny lever news Digital Sukoon Founder, Sudhanshu Kumar Received "Best Digital Agency Award"
Digital Sukoon Founder, Sudhanshu Kumar honored with the Dr.Babasaheb Ambedkar Nobel Award by International Human Rights Council at Hotel Sea Princess Juhu Mumbai. Among the awardee, Digital Sukoon was the Best Digital Agency of the Year 2019 to receive the award. 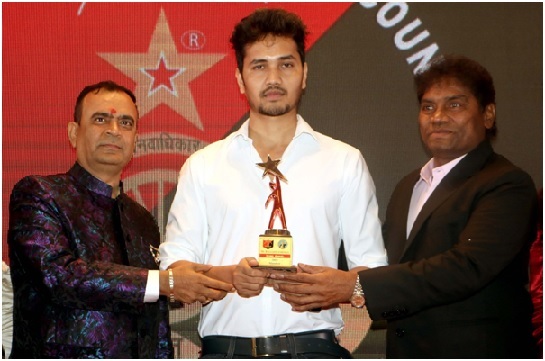 Yogesh Lakhani of Bright Outdoor Media, Actor Johnny Lever, Jasleen Matharu also received awards in various other categories. For any brand, channel, movie or even celebrity, promotion is critical. In this technology driven modern world, Digital presence forms the backbone of any promotional campaign as it ensures maximum penetration across demographics and geographies. Digital Sukoon (DS) brings together a team of young, highly-charged up, tech-savvy professionals who have already made a mark in various verticals including technology, content creation, and social media expertise. In a short span of time, the agency has made a mark for itself by successfully managing various campaigns like My Mother's Wedding, Mukti Bhawan, Shaadi Abhi Baki Hai, 3 Dev, Jack &Dil, Falsafa the Otherside Saheb, Biwi Aur Gangster 3, Kaashi In Search of Ganga, Paharganj, Albert Pinto ko Gussa kyun aata hai, Fraud Saiyaan a social comedy starring some big names in the Industry. Digital Sukoon (DS), a Mumbai based Digital solutions agency, provides a comprehensive 360-degree solution to their clients' promotional needs by adopting breakthrough strategies, innovative campaigns and optimum usage of technology tools. The motto of the company is to offer ‘Sukoon' i.e. Peace of Mind to the clients by taking charge of and addressing all digital marketing needs under a single umbrella. This approach enables the client to maximize the Return on Investment with complete peace of mind and high level of comfort.